After the Inverted Vee was damaged in a storm, I found Walle PE2WJW willing to go onto the roof. For a week we were looking at the whether. Yesterday the "window for dry whether" was width enough to go onto the roof. Walle first recovered the feeding ribbon and top part of the old Inverted Vee from the roof. I attached new wires (indoors) and Walle installed the new antenna on the roof again. It was dark already, when the job was done. That evening I listened for a short while. I did hear some activity, but the signals were weak. The next day I made a QSO with 360 mW with Laszlo HA6NL in the OQRP contest. Good for more than 1000 Miles per Watt. I find it difficult to compare antenna's. Before the the repair, I made a few QSO's in the Croatian CW (Click) on the remaining wire of the damaged antenna. At that time the signals were very strong. I just looked in the Log and found out, that I also made a QSO with HA6NL with in the Croatian CW. So I think that the new antenna is working well, but that the difference is caused by the propagation. I had great fun in participating in the Croatian CW contest, on a wire of 10 mtr. I did not expect this amazing result with my crippled antenna. The inverted Vee lost one of it's wires in the storm in November. I used the remaining wire that lies partly flat on the roof. I had to take it easy, so I did not make many QSO's. But I still had fun. On Saturday I started with 5 QSO's on 40 m, in which I had to use 2.7 watts. After 2 more QSO on 40 m on Sunday morning , I went to 20 m. I was surprised by the signals on 20 m. The signals were very strong S9 plus 10 dB. So I immediately decided to use the lowest possible power. With the pre-programmed messages and the pre-programmed serial numbers in the Morse Machine, I effortlessly made the QSO's on 20 m.
Please notice: Propagation and Activity are much more important than the antenna. Who would expect, that I could make 4 QSO's with just 36 mW on a wire of 10 mtrs. Well, I would'nt. 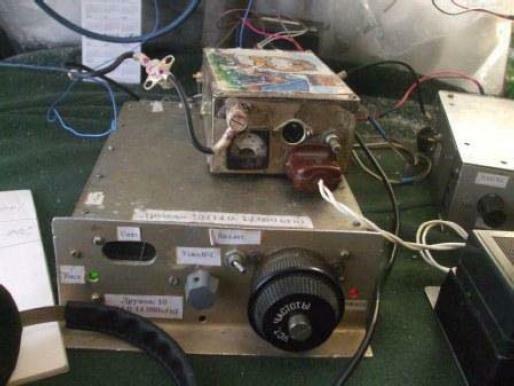 All the QSO's on 20 m are made with more than 1000 Miles per Watt. So I don't complain about my antenna, but I am grateful for the excellent propagation. While I was in the hospital the storm damaged my antenna. The top of the antenna came loose and dropped to a point 2 mtrs above the roof. Later the wire that is (was) visable on the photo broke. The wire on the opposite side of the house lies partly flat on the roof. Much to my surprise I managed to make a few contest QSO with very low power. 2.7 W down to 36 mW. Yesterday I received a fascinating photo story in PDF from UA1CEG/P. Yuri has been active from the forest in the Croatian CW contest with a homebrew transceiver of 3 watts and a Delta antenna for 20 m.
The photo story in PDF shows the beautiful snow landscape in which Yuri was operating from his Wigwam shack. The mercury dropped to a value of 15 degrees Celsius below zero. Brrrr. The photo's also show some of the pages from Yuri logbook. I enjoyed reading and viewing the photo-story. Thanks to Yuri UA1CEG for writing the story and to Oleg RV3GM for the translation into English. Большое спасибо за интересный рассказ. Мне понравилось. Eind november ben ik met spoed opgenomen in het ziekenhuis. Ik was onwel geworden. Het bleek aan mijn hart te liggen. Nadat de hartslag enkele dagen bekeken is, is er een pacemaker geplaatst. Ik moet het de komende weken heel rustig aan doen.